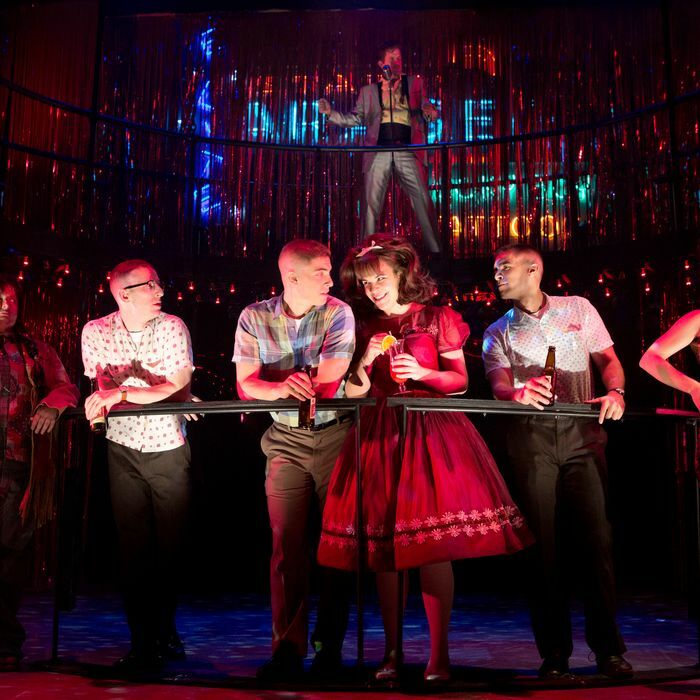 Dogfight, an intriguing and occasionally brilliant chamber musical from soulful young composers Benj Pasek and Justin Paul, is a fascinating paradox — a whole slew of them, really. It’s a period show (set in antediluvian, pre-assassination 1963) with only token nods to period music. It’s an intimate show with moments of attempted cinematic grandeur. It’s a story about the close kinship of cruelty to innocence, and how, ultimately, they annihilate one another, a story with deep violence underneath its soldiers-on-the-town picaresque … and yet its governing musical mood is a wistful, rippling reflection. It’s brutally honest, yet persistently muted. Dogfight, as tenderly realized by director Joe Mantello, isn’t quite a show for the ages, but it’s a production to remember and celebrate, as well as the announcement of several major talents: its composers, certainly, but also its stars, Derek Klena (Carrie) and Lindsay Mendez (Godspell). The book (by Breaking Upwards screenwriter Peter Duchan) is uncommonly solid, especially in its handling of its winning pair of leads. Duchan makes judicious use of Bob Comfort’s simple and superb screenplay from the semi-obscure 1991 independent film of the same name, which starred River Phoenix as a callow young Marine about to deploy to Vietnam in ‘63 and Lili Taylor as the nerdy, folky, frumpy girl who befriends him on his last night Stateside. Here, the lost young Jarhead Eddie Birdlace is played by newcomer Klena, a fierce and flat-eyed talent with unpretentious, unpredictable energies. Charged with bringing the ugliest girl he can find to the “Dogfight,” a vicious ritual anti-prom thrown by young Marines on the eve of shipping out, Birdlace lights on Rose (Mendez, open, brave, devoid of all contaminating ironies and in lovely voice). She’s a waitress in her mother’s diner, plucking away at a battered guitar, listening to Dylan in her room and dreaming of better worlds. Hardly hideous but deeply awkward — caught uncomfortably between the fashions and failures of the fifties and a new world not-yet-come — Rose, like Tony in West Side Story, is waiting for something big and undefined and thrilling. The change she anticipates will arrive with a gunshot in less than a month: But tonight is all about Eddie, a handsome, angry boy who wants to take her to a “party” for reasons she can’t quite understand. Dogfight is a tiny show with a lot of moving parts, and not each of those cogs click. In fact, some components operate almost independent of the main clockwork. Pasek and Paul are inarguably gifted composers who write inarguably elegant songs — clinics in structure — with passably robust lyrics. (And veteran orchestrator Michael Starobin shows off their work to good effect.) But their strongest songs, the ones drawn from the singer-songwriter tradition of the seventies, still a dominant force in music-theater songwriting (after, of course, Sondheim and the so-called “American Songbook”), are also their gentlest. It’s a style at odds with the angrier, less controllable passions of this exploding snow-globe of a story; its angles can be sharp, but they’re always carefully calculated. (And they can have a static quality: As is so often the case in this sort of songwriting, too much time is spent musically updating a character’s current emotional status, like a series of mellifluous tweets telling us something self-evident.) Still, this pair of talents is clearly in possession of promising instincts. One senses they’re just getting started, and they’ll have a dog in this fight for many years to come. Dogfight is running at Second Stage Theatre through August 19.